This is a comfortable, soft sweatshirt that will help you stay cozy during the cool days of autumn and into winter. It is constructed from a high quality cotton blend fabric that is machine washable in warm water. The sweatshirt may be successfully dried on a low temperature setting. It is white with multicolored print throughout, that appears in a kiss theme. 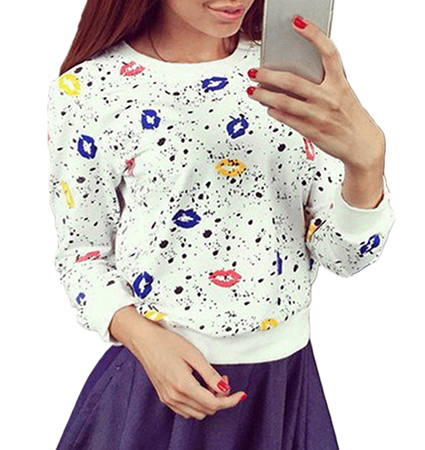 The sweatshirt is accented by bands of white trim at the neckline, hemline and on the cuffs. This garment has no buttons or zippers and slips on easily over the head. It is available for purchase in sizes Small, Medium, Large and Extra Large.